Research funds from Gerber/Nestle provide new information on management practices for growers with established Bartlett pear acreage. Michigan’s pear industry is primarily Bartlett pear used for processed product by Gerber/Nestle Company. Most pear orchards in Michigan are 40 or more years old, and poor flower efficiency is a perennial frustration for growers who manage these trees. Growers are actively looking for strategies to increase the productivity of their existing acreage to help make future pear ventures more profitable. Root pruning during bloom is a strategy that has been successfully deployed on the west coast to increase fruit set of established D’Anjou pear. This same strategy had not been applied to Bartlett pear in Michigan, so trials to evaluate this practice were set out by Gerber/Nestle Co. and Michigan State University Extension in 2017 and 2018. In 2017, two blocks of at least 50 trees were root pruned approximately 3 feet deep at 4 feet from the trunk. In 2018, another two blocks of at least 50 trees were root pruned in the same way. Two control blocks of at least 50 trees were not root pruned in either 2017 or 2018. In the spring of 2018, a single limb of 30 trees in each of the six treatment blocks was randomly selected prior to bloom. At bloom, all flowers on each limb were counted. In late August, the number of fruits on each of these same limbs was counted. The number of fruit recorded immediately prior to harvest was divided by the total number of flowers counted during bloom for each tree to determine flower efficiency. This data collection will be repeated in these treatments in 2019 and 2020 to examine the long-term impacts of the practice. A one-way ANOVA and pairwise tests were conducted across the means of each treatment to determine any significant differences between treatments. 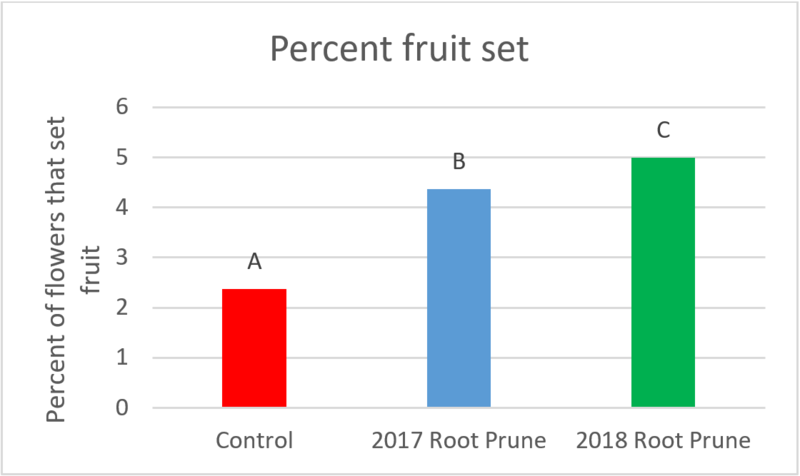 The trees that were root pruned during bloom in 2018 were more productive at 5 percent fruit set than the 2017 root prune treatment or the control (ANOVA, p<0.05). The 2017 root prune treatment was the second most productive treatment at 4.37 percent fruit set, while the control treatment was the least productive at 2.38 percent (p<0.05). All three treatments were significantly different from one another (Fig. 1). Figure 1. Percent fruit set of three root pruning treatments of Bartlett pear, 2018. These results indicate that root pruning at a 3-foot depth at a 4-foot spacing from trunks is effective in increasing yields in established Bartlett pear plantings in Michigan. Both the 2017 and 2018 root pruning treatments were 1.5-2 times more productive than the unpruned control treatment. 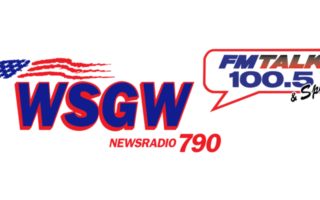 Furthermore, the heightened yield from the 2017 root pruning treatment indicates that this treatment has positive effects that carry in to at least the following season in addition increasing yield in the season in which it is conducted. The continuation of this project in 2019 and 2020 will help to further this subject and understand how many seasons post-prune an increase in yield could be seen. This strategy could prove to be a cost-effective way for farmers with established Bartlett pear acreage to reinvigorate yield in shy-bearing trees.